A relatively small but extremely moving memorial site in Hamburg, Germany. It commemorates a particularly heinous crime committed by the Nazis towards the end of WWII: the murder of 20 children from the concentration camp of Neuengamme who they had performed medical experiments on. Even though these murders were committed in order to cover up any traces of those deeds, it has subsequently become one of the most thoroughly researched and best documented cases of any such Nazi crimes. More background info: The children had been inmates at Auschwitz, deported there from various parts of the Nazi-occupied territories in WWII (in particular: Poland, France, the Netherlands, Italy and Yugoslavia). At Auschwitz they and their mothers were housed in the women's camp part, the kids in the “children's block”, where they were already subjected to medical experiments. Then in November 1944, these 20 kids, ten girls and ten boys aged between 5 and 12 years, were specially selected by SS doctor Josef Mengele himself to be sent to the concentration camp of Neuengamme near Hamburg, for a special series of tuberculosis experiments. Once there, Neuengamme's SS doctor Kurt Heißmeyer used the children for his vicious “tests”: injecting them with tuberculosis bacteria in order to test his theories on the disease and possible cures (somehow be believed that deliberately creating a second infection could outdo a first one … but of course that was wrong). All these experiments were well documented and photographed and filed in an orderly fashion (just as in other camps – cf. e.g. Dachau!). By March 1945, however, it had become increasingly apparent that Germany was losing the war. So the experiments were terminated and the Nazis decided to cover up their medical crimes while they still could. For the children, this meant that they had to be “disposed of”. So on 20 April 1945 (ironically the day Adolf Hitler celebrated his final birthday), the children were taken to the former school at Bullenhuser Damm in a working-class district near the harbour of Hamburg. The edifice, originally built in 1910, had been used as a satellite camp of Neuengamme since the autumn of 1944 (it had ceased functioning as a school following the devastating aerial bombings of these parts of Hamburg – cf. Bunkermuseum Hamburg and Nikolaikirche). As the Third Reich's war effort was collapsing and the fronts draw nearer, many of the concentration camps were “dissolved” and the inmates “evacuated” (i.e. taken elsewhere). This included Neuengamme, whose evacuation was ordered on 19 April 1945. The satellite camp at Bullenhuser Damm had already been completely evacuated by 20 April (with the inmates transported to POW camps such as Sandbostel). So the school was left standing vacant, meaning there were no witnesses there. The murders took place in the cellar of the school. 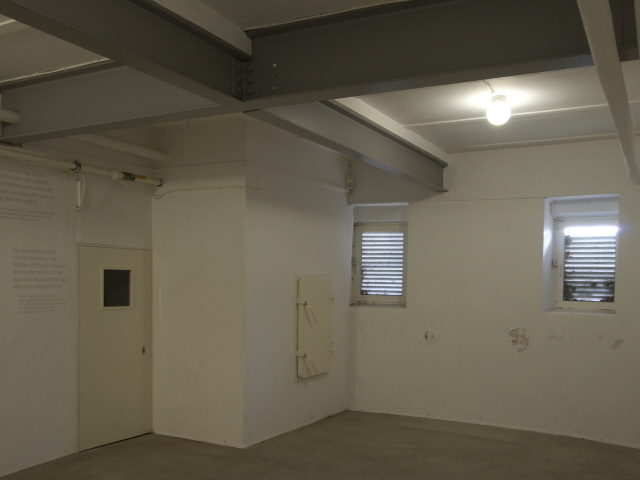 The children and the four adult inmates that had served as the children's carers at Neuengamme were taken to the back of the former schoolyard and led down to the basement. The adults were taken to the boiler room where they were hanged by SS men. The 20 children had to undress in the room next door, the former school gymnasium's changing room, then they were first given morphine one after the other and then hanged in the boiler room too. In addition, some two dozen Soviet POW inmates from Neuengamme and other satellite camps were murdered here as well (why them too, remains unknown to this day). The whole operation, which took place all through the night, was overseen by SS officer Arnold Strippel. Afterwards, to erase any traces of the crimes, the bodies were taken back to Neuengamme where they were burned in the camp's crematorium. The clothes of the victims were burned straight away at Bullenhuser Damm's boiler room. It was just a couple of weeks later that Hamburg was liberated by the Allies, on 3 May 1945. In 1946 a British military tribunal tried a number of SS men from Neuengamme, including several of the perpetrators of the children's murders at Bullenhuser Damm. Five of these were sentenced to death and executed later that year. Two key perpetrators, however, did not appear before these tribunals. One was Kurt Heißmeyer, the doctor who had performed the medical experiments on the children at Neuengamme. He managed to go underground at the end of the war and escaped to the east. There, in the Soviet occupation zone, which later became the GDR, he successfully returned to his civilian medical profession, even running his own clinic in Magdeburg as a pulmonary specialist. Even though the Stasi, the GDR's secret intelligence service came to know about the former deeds of this respected doctor, they didn't go after him but merely kept him under surveillance for a decade or so. It was only in 1963 that Heißmeyer was finally arrested. On the basis of the evidence in Heißmeyer's own records as well as from witness reports obtained in the earlier British trials, he was eventually sentenced to life imprisonment. He was incarcerated at the infamous Bautzen prison where he died in 1967. The other one who got away was Arnold Strippel, the SS man who had supervised the murders at Bullenhuser Damm. He too managed to initially escape the British trials in Hamburg but was arrested in 1948. Strippel, who had served at a number of concentration camps before coming to Neuengamme (including Buchenwald, Ravensbrück, Majdanek and Vught), was tried in Frankfurt and initially sentenced to life imprisonment, though not for his deeds at Bullenhuser Damm but for crimes he had committed at Buchenwald. He appealed and in a second trial was acquitted of murder. So he was released early in 1969 and was even awarded compensation for his “wrongful” imprisonment (and a pretty sum it was too, over 100,000 German Marks – quite a fortune at that time). Strippel hadn't been tried for his involvement at Bullenhuser Damm initially for lack of evidence, but the case was eventually reopened in the1980s. By that time the Association of the Children of Bullenhuser Damm had been formed (see below) and was campaigning for the prosecution of Strippel. However, in 1987 the Hamburg district court found Strippel unfit for trial. So he got away again. He died a free man in 1994, aged 83. Meanwhile, the school building at Bullenhuser Damm was returned to its original function after the war (and renamed Janusz-Korczak school). Only after years of campaigning by Neuengamme survivors was a first memorial plaque unveiled at the school in 1963. The identities and life stories of the 20 children and their carers long remained largely unknown. This began to change in the late 1970s, first with the publication of a book by a Neuengamme survivor about the murders of the children at Bullenhuser Damm, and then through the dedicated work of German journalist Günther Schwarberg, who published a series about the case in the magazine “Stern”. This finally gave the story a wide circulation. Schwarberg also managed to track down relatives of the murdered children and their carers and thus, piece by piece, some of the identities and biographies of the victims could be unravelled. In 1979 the Children of Bullenhuser Damm Association was founded by Neuengamme survivors, relatives of the children as well as some dedicated Hamburg citizens. 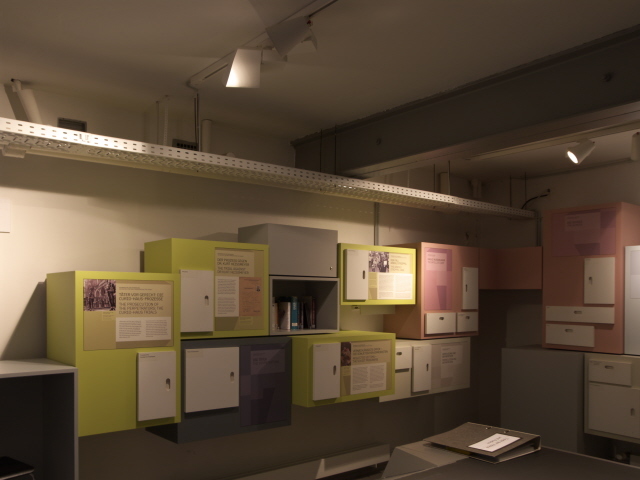 This association opened a first memorial with a modest exhibition about the case in 1980, in the very basement rooms where the atrocities had taken place. In addition, the rose garden at the back of the school's yard was also begun in the 1980s. Even though the school as such closed in 1987, the memorial and the rose garden survived. In 1994 a new exhibition was opened that had been set up in co-operation with the Neuengamme Concentration Camp Memorial. In 1999 the exhibition officially passed into the management of the Neuengamme memorial. I remember that older exhibition as a sombre but simple commodification by means of German-only text panels and photos. It was touching but old-fashioned, and: it did not cater for international visitors at all. Then in 2011 an all-new exhibition finally replaced that rather dated earlier incarnation. This was completely redesigned, made bilingual throughout and expanded too. I finally went on a return visit in the spring of 2017 – see the account below. The story of the development of the memorial as well as that of the research into the victims' life stories is quite fascinating – and still not complete. Some of the Polish kids' stories still remain largely mysterious. In some cases sheer fluke helped in the reconstruction of these stories. For instance in the case of one of the Dutch carers of the children: one of the photos taken during the medical experiments also showed the hand of an adult who held the child's arm up for the photo, but whose own face was never visible in any of the photos. But four decades later a fellow former Dutch inmate got to see the this photo and recognized the ring on the adult's hand as one of two he had made for a friend of his and himself. Thus the identity of Anton Hölzl was determined. The discoveries continue. As late as in the summer of 2015, one of the children's identities was finally clarified. All that was known about this boy until then was his approximate name, recorded (slightly erroneously) as “W Junglieb”, and the assumption that he must probably have come from Yugoslavia. However, a Holocaust survivor and relative of one of the other murdered children managed (with the help of the Yad Vashem memorial) to track down the sister of the kid in question. She too was meanwhile living in Israel. The woman, named Grete Hamburg (what a coincidence that her surname should match that of the city!) had not known about the fate of her brother but was now able to fill in the details, including his full (and properly spelled) name: Walter Jungleib. Also clarified was his actual origin, which was not in Yugoslavia, as previously assumed, but a place in Slovakia. Grete Hamburg eventually visited the Bullenhuser Damm memorial in 2016 and donated her brother's stamp collection album to the memorial. This was then proudly incorporated into the exhibition. Who would have thought that such “miraculous” developments should still be possible over 70 years after the events in 1945 … amazing! What there is to see: The old red-brick school building is quite a sight itself, given the rather drab industrial surroundings it now stands in. By the road there's an information plaque and signposting takes you to the entrance of the actual memorial, which is at the back of the school, i.e. accessed from the former schoolyard. By the door are is another introductory information panel. Inside you come to a staircase. Upstairs would be the former school as such, now also a seminar room. To the side of the stairs is a large-scale painting that was made in commemoration of the crimes that were committed here. Also by the stairs is a first set of text-and-photo panels providing some background information about the school building itself. But the actual site of the murders of the children and today's exhibition about this are downstairs in the basement. At the heart of the exhibition is an installation with 20 suitcase-like display cabinets that provide information about what is known about every individual story of the murdered children. One to look out for especially now is that for Walter Jungleib, whose story was only discovered very recently (see above). This now also includes the stamp collection album donated by the boy's surviving sister. 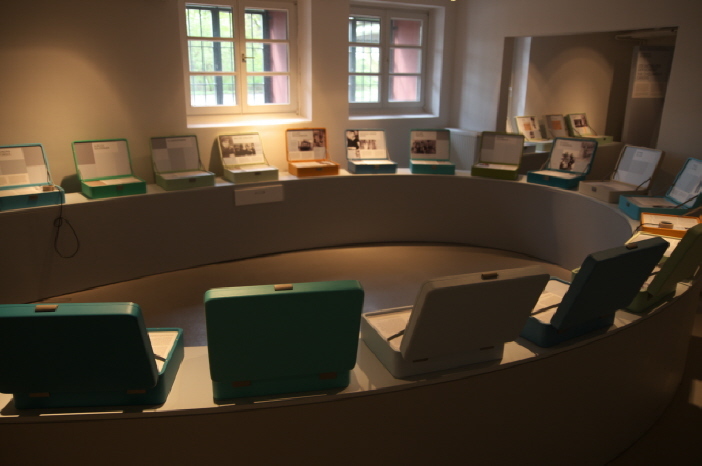 Next to the oval arrangements of the “suitcases” for the children, a straight row of four such cases also covers the biographies of the inmates who were the children's carers at Neuengamme and who were also murdered here on 20 April 1945. 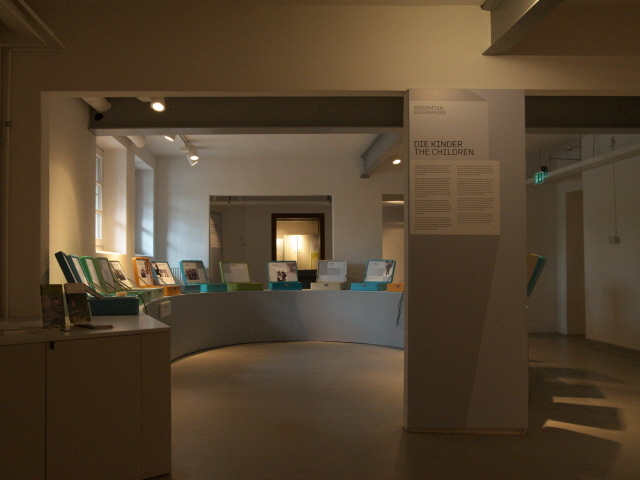 Along the opposite wall, a panel provides insights into the school's role as a satellite camp of the main concentration camp of Neuengamme, another is about the medical experiments performed on the children there, and a third one gives general background info about persecution and deportation during the Nazi times. Set aside to the left is a panel covering the stories of the perpetrators. In a side room there is lots of material for further in-depth study, including plenty of documents as well as videos of interviews with relatives of the murdered children. You can ask at the information desk by the door for these to be played. Another doorway leads to the main memorial site. The German text on the wall states the nature of the crimes perpetrated here as well as the names of the victims (as far as they are known – the murdered Soviet POWs are only mentioned as such, anonymously and collectively as it were). At the bottom of this, flowers, wreaths, pebbles and other objects are placed in memory of the victims. 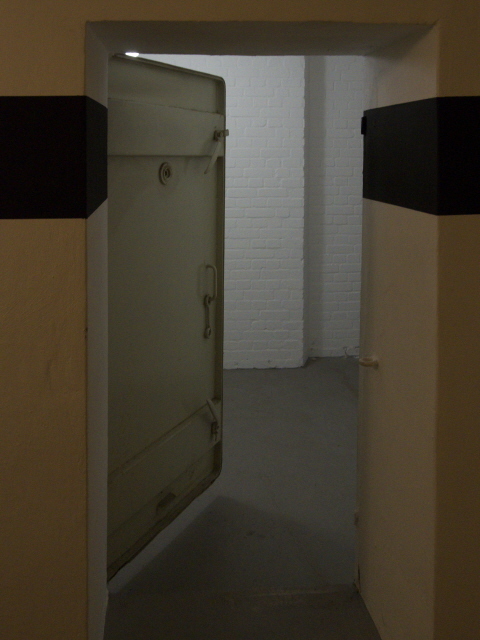 A side door then leads into the cellar room where the actual murders were committed that night in April 1945. The room has been left bare. There are only a few quotes from the trials against the perpetrators written on the whitewashed walls. It's all very sombre. The relatively new exhibition (opened in 2011 to replace the older one from 1994) is a massive improvement! Not only is there more information than there was before, there are also a few intriguing objects – and most importantly from an international visitors' perspective: everything is now not only in German but also English (and the level of translation quality is absolutely excellent!). 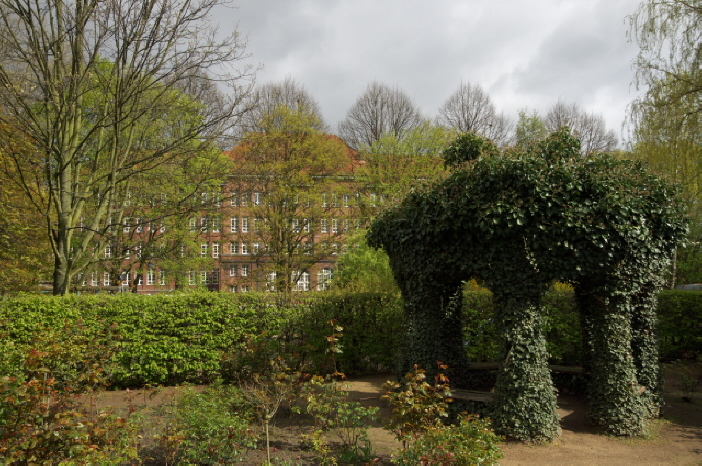 Apart from the exhibition there is also the rose garden at the back of the former schoolyard. This is really just a commemorative space, serene and peaceful as such a garden should be. The only information comes in the form of little stone plaques for each of the victims that resemble little tombstones, complete with little rounded portrait photos (where available) and a short text in German. The one for “W. Junglieb” from “Yugoslavia” is now outdated (see above!). All in all this is a tremendously moving site and even though it isn't very big it is absolutely worth seeing, especially as an add-on to a visit to the huge memorial site of the concentration camp at Neuengamme. Location: some two and a half miles (4 km) from the very heart of the city centre of Hamburg, in the south-eastern, mostly industrial district of Rothenburgsort. Address: Bullenhuser Damm 92, 20539 Hamburg, Germany. Access and costs: off the tourist track, though not too difficult to get to, but open only on Sundays; free. Details: To get there from the centre of Hamburg it's best to get the S-Bahn (urban railway) line S21, e.g. from Hauptbahnhof (central station). Get out at Rothenburgsort. From the exit of the station head north and then turn right into the street Ausschläger Billdeich. This crosses a canal and shortly after, just beyond the intersection with Großmannstraße, takes you right to the back of the former school, where the rose garden is. The imposing red brick edifice is hard to miss. The way to the entrance of the memorial site is signposted from here too. When coming by car, you should try to find parking somewhere on the street Bullenhuser Damm itself (there aren't any spaces elsewhere in the immediate vicinity), which on a Sunday shouldn't be too tricky. You may even manage to get one directly outside the ex-school building itself. From there you have to go to the rear of the building, facing south, to get to the entrance to the memorial and to the rose garden. It's signposted. Opening times: the memorial site in the cellar of the former school is open ONLY on Sundays, from 10 a.m. to 5 p.m. (otherwise by prior arrangement only). 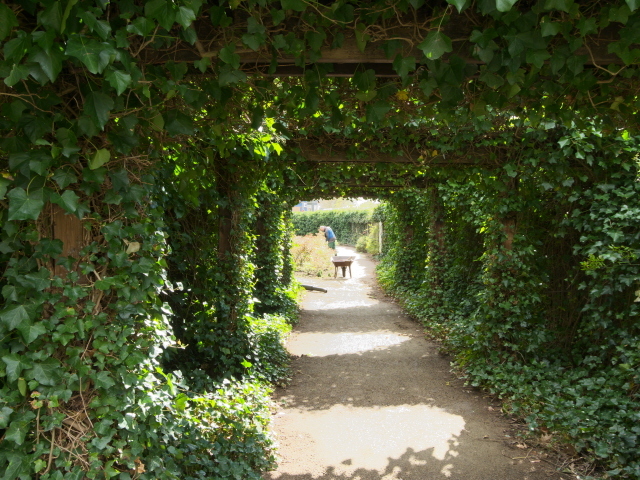 However, the rose garden at the back is freely accessible at any time. Guided tours are possible too but have to be arranged in advance (by phoning the Hamburg Museum Services number: +49-40-4281310). Time required: between about half an hour for a cursory impression to well over an hour for a more in-depth visit. If you want to explore all the additional information available in the rear in-depth-study room, you could probably spend a good few hours more here. Combinations with other dark destinations: The closest other dark site, within walking distance in fact, would be the Bunkermuseum Hamburg – but unfortunately the opening times of the two respective sites do not overlap. So you'd have to do them separately. It is, however, possible to combine a visit with going all the way to the former concentration camp of Neuengamme. This is also thematically linked to the Bullenhuser Damm memorial, because that's where the medical experiments on the murdered children had been performed. Neuengamme requires a lot of time, though, so if you want to do both sites on the same day, you'd have to get an early start. At least both sites are reached using the same urban railway line (S21), which helps a bit. In the other direction, this line also quickly takes you back to the centre of Hamburg. Combinations with non-dark destinations: Nothing in the immediate vicinity – which is a rather dull industrial quarter. But just two stops on the S-Bahn away is the very heart of touristy Hamburg, so it's easy to combine.